"Talk about miracles, that recipe for cola canned ham. Mmm. Ms. Peletier, you are an honest to goodness hero." I get it. Food that actually resembles food before the zombie apocalypse. Food that tastes good. It is pretty miraculous. It's also a harsh reality that you can be praising somebodies kitchen prowess one minute, and then being mercy killed by them a few hours later. Little did Erin know how true her statement rang. 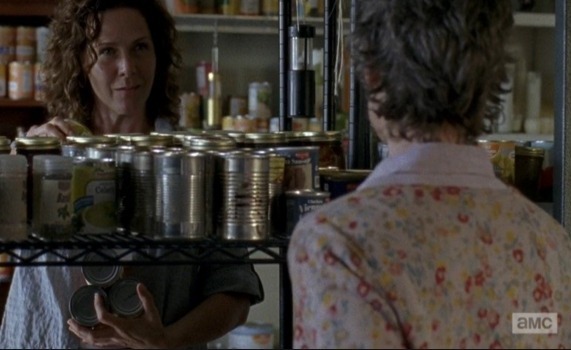 That's why I chose this exchange between Erin and Carol (Ms. Peletier) as inspiration for today's Dead Eats: Recipes Inspired by The Walking Dead post. 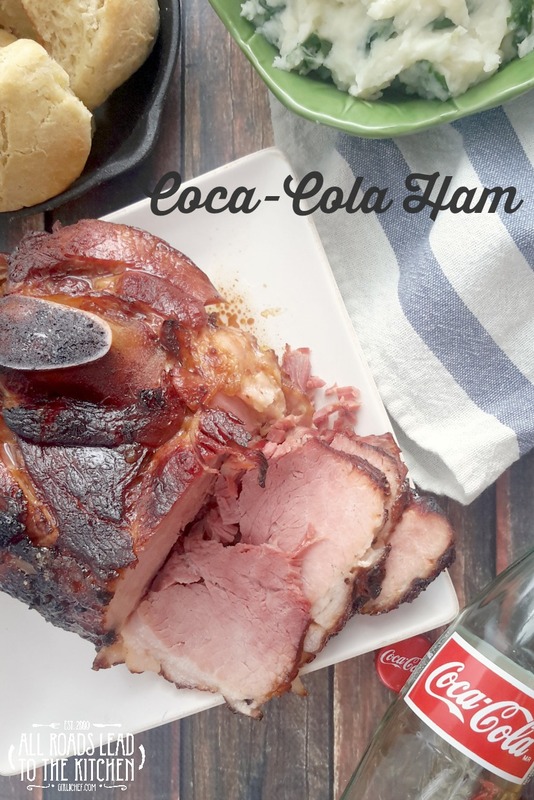 Well, that and the fact that Cola Ham is a delicious sweet and salty delight and I've been craving some for a while now. Plus, it's mid-season premiere day...the day we've been working up to all week long! Initially I intended to actually buy a canned ham. I wanted to go old school and puncture the can, pouring out the ham juices and replacing them with cola. But I couldn't find one. Do they even still sell them? 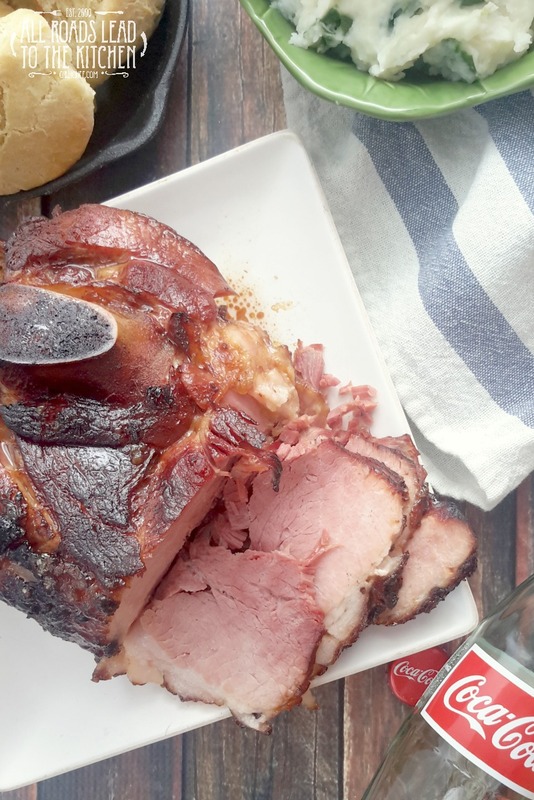 I'm talking hams in an actual can that can be used as the cooking vessel. The only kind I could find had more of a rigid plastic "can" that definitely should not be used in the oven. And after looking at the price...it was slightly more expensive than a small bone-in half picnic shoulder...I didn't think it would be worth it. I don't mind a pressed ham, but I much prefer a real one. Erin praising Carol's kitchen prowess and bestowing her with hero status. This recipe is actually one that I make every couple of years or so. It's super simple, but has amazing flavor. 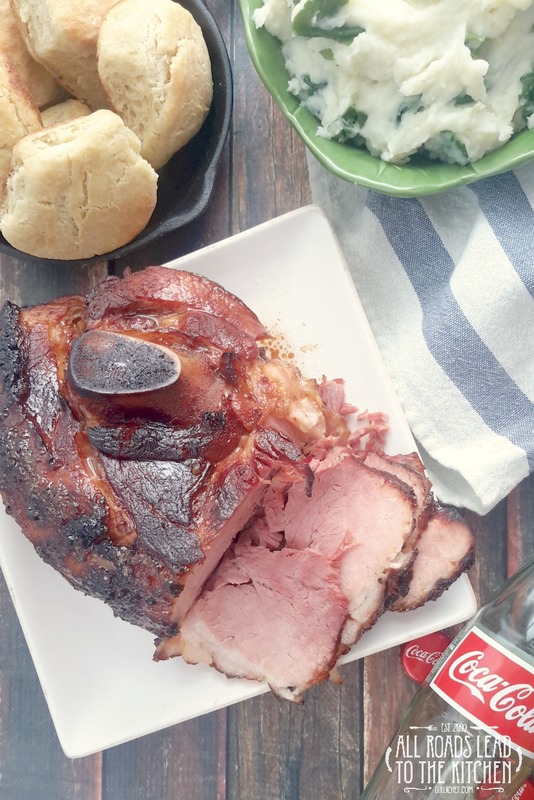 A smoked picnic shoulder is braised in Coke (use full sugar Coke, not diet...and preferably the real sugar kind), lending sweetness to the tender ham. 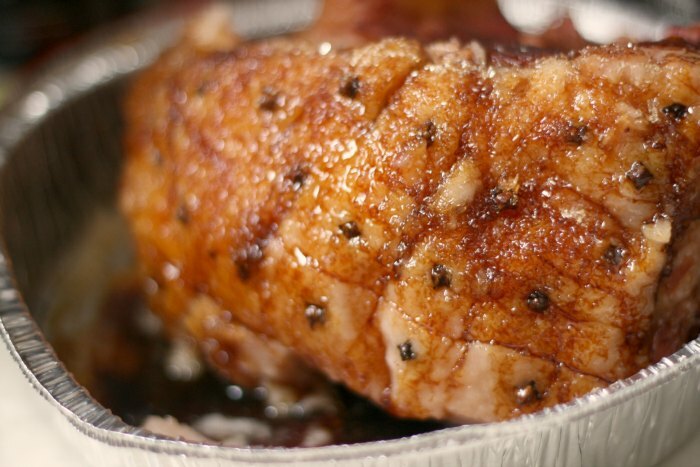 A quick blast in a super hot oven sizzles and crisps the fat on the outside that has been studded with cloves and coated in molasses, sugar, and dry mustard. Oh, and gives it crispy bits. The crispy bits are my favorite. Dare I say, it's kind of miraculous? 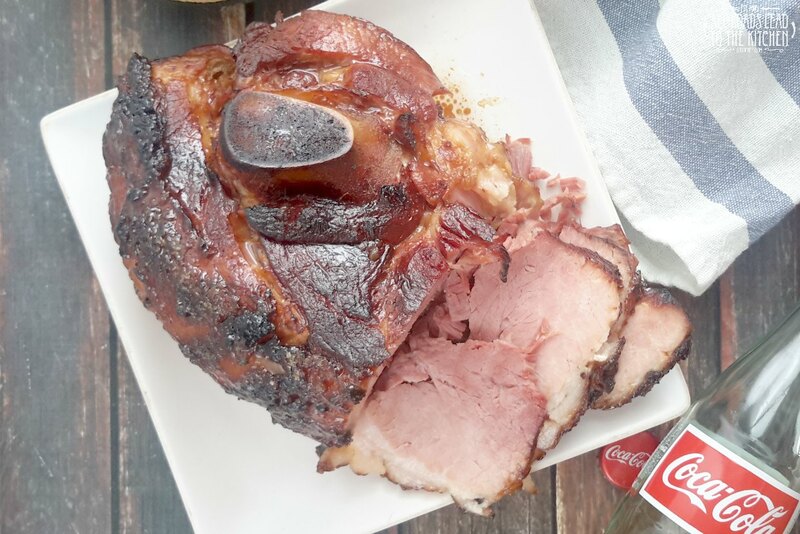 This bone-in smoked picnic shoulder is braised in Coca-Cola before finishing it in the oven to get some sweet and crispy bits. Set the pork shoulder into a pot that is just large enough to hold it (I use my 4-quart soup pot), skin side down, with a little space around the edges. Tuck the onion halves into the pot, the pour the Coke over and around the ham. Bring to a boil, then reduce to a steady simmer. Put on the lid. If the lid won't fit with the pork in it, you can form a foil lid or do what I do and invert a stainless steel bowl the same diameter as the pot over it (when needed). Cook for 2 1/2 hours. Preheat oven to 500° F. Line a roasting pan with foil (or use a foil roaster). Remove the ham from the pot (don't throw the juices away - save them to make black bean soup). Pull the skin off of the ham. Score the fat into diamond shapes with a sharp knife. Stick a whole clove into the center of each diamond. Pour the molasses over the studded fat, then sprinkle the sugar and mustard powder evenly over it, pressing it on gently with your hands. Slide into preheated oven and roast for 15 minutes, or until the glaze is dark, sticky, and bubbling. Remove from oven and allow to sit for at least 10 minutes before slicing.